When the subject of rarity and Omega Constellations arises, the intuitive course is to point to the earlier 1950s models in the Constellation family, such as black guilloche dials, Globemasters and early calibre 352 RG powered examples. However, one of the rarer Omega Constellations on the planet is a 'homage' Pie Pan produced twenty years later for a short period in the 1970s. It was earmarked for the Japanese market only. In more than twenty years of collecting watches, I have only encountered four examples of this elusive Pie Pan and one example of the flat dialled version: all of them since the maturation of the internet. I'm happy to post all comments. I'd love to see a few more of these on the market. Just not all at one time. Desmond's example is the first one of these I've seen in almost two years! Very intreresting site. I have been trying to judge whether http://www.tradera.com/Omega-Constellation-Chronometer--auktion_96584234 is a fake or not. I would gladly appreciate your opinion. The watch is a total frankewatch. I have a Omega solid gold watch, Automatic cronometer officially certificated, date bevelled corners, with a gold Calibre 561 deluxe piepan dial with onix insert markers with matching black insert dauphine hands.Case 168.016 solid Gold. How much so you thing I can sell it for? A 168.016 should carry a calibre 751 movement. I own a vintage Pie-Pan Constellation from the earlier 60's... my questions is in regard to the dial: it is divided into 4 quadrants on the face by a thin line. Most Pie-Pans of this era I find do not have these markings. Was this specific to a year, a flash in the pan style? Just curious. Thanks. Yes, the dividing lines are commonly referred to as 'cross-hairs', and they really are that fine. One way to determine if a dial has been refinished is to look at the fineness of the cross-hair as re-finishers just don't seem able to get it right. I just found one one of these 168.0065 for sale. It seems to good to be true as it's ine pristine condition ; like new I coumld say. I carefully looked at all the specs in detail and nothing looks wrong : chamfrain, dial, hands, crown, movement, length of the seconds hand. Hence my question, what could be wrong with it. What should I be carefull about? Hi Desmond thanks for your prompt answer. And your blog too! "magnifique" as we say in France. Weel, so, I checked everything and nothing wrong. 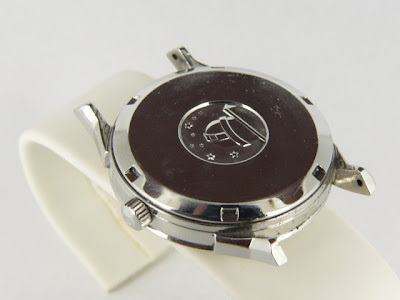 The dial in mint, no trace of any repainting. Must the hour markers have a painted dash or only between the markers? Hope you see what I mean. Do you find it normal that the seller assures me that the serial numbers are ok but doesn't want to give them to me before payment? I'd say the only con is the price. I ask for $1600. I don't really know what to think about that price. Thanks for your prompt answer and your "magnifique" blog as we say in France. I feel like ma last message have not been sent. So I reply again. Do you now haow many copies were made of the 168.0065. I checked everything you mentionned. The dial doesn't look like it's been repainted. Do you know if it has some weird cuts in it? It's always a kind of pain in the neck when you come upon one of these pristine watch. I'm an horologist so it will be no problem if something goes wrong with the movement. I have an easy access to Omega parts. It doesn't mean I don't care about buying a fake! Can I send you a few pics so you can tell me our opnion on it? Thanks again fort your answer. I suppose you are speaking in dollars. For the markers there are some in your essay. On the one for sell too. The guy wants $1600 but the watch is really in a incredible condition. I'm going to try 1400. If you come to Paris and need some help in anyway I'll be glad to help. What do you think of this gold one? I gave some doubts because it seems to pass the moy test though te second O in chronmeter looks weird. look at the final N in constellation. Don't you find the curl suspicious? have some good time in Europe! The eBay example is indeed a British Dennison model, however the lugs and bezel have been over polished and the case definition has suffered. These models look so much better with sharp lugs. Quite tidy. A few minor spots on the dial and some corrosion of second sweep. Case looks sharp. Hand wind movement looks in good condition, however as the seller has not indicated the watch has been serviced you would need to factor in the cost of having a new crown, and the movement cleaned and oiled. Movement is seventeen not 24 jewels which is par for the course for a hand wound watch. Not a rare watch as claimed but nice minimalist styling and popular pink gold metal. Theses watches measure about 33 mm across. many thanks Desmond for your kind response. Both are of a similar style. The case on the first example is in better condition. I would ask for a high res pic of the dial to confirm that it hasn't been refinished and also to inspect it for any blemishes or degradation. Movement has a few scratches, which is strange because the seller's notes indicate the watch needs a service. So you need to put aside money for service with this watch. More research on the dial methinks. many thanks Desmond, your opinion is appreciated. 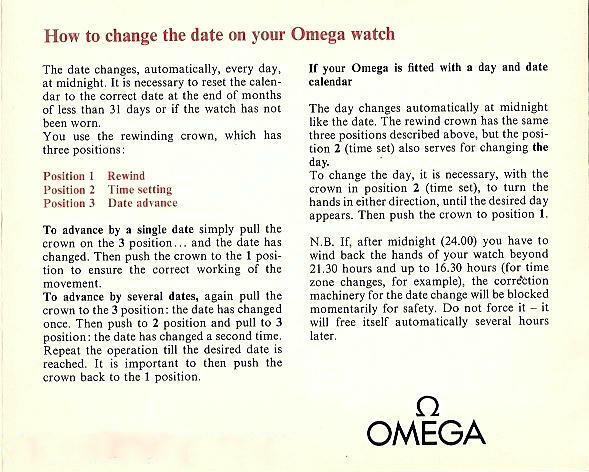 Thanks to your marvelous website I'v found one Omega constellation 168.0065. I think I would have not pulled the trigger if I haven't read your article ! Thanks because it's, for many months, my favourite. Now I' trying to find a steel bor bracelet for this beauty. Do you think a 8270 with 70 endlink will fit ? Thanks for your help ! Sorry that should read 18mm! Thanx for your help Desmond !